This would seem to suggest that the possible easing of the Green surge in broader voting intention hasn’t yet taken effect on campus. Students, it would seem, are the greenest demographic of all. They also seem to be more engaged than other young people, with 71% intending to vote. How many do so is the question, as turnout is notoriously tricky to predict. The poll also asked about registration and found that 78% of students were signed up to vote. Of those that were, a majority (56%) said they were registered at home and not living there, 27% were registered at university, 13% were registered at home and living there in term time, and the remaining 4% were unsure where they were registered or gave another response. Some of those registered at home but not living there might have postal votes, but since many universities will still be in term time on May 7th, this has to be of concern to any party counting on student support in May. 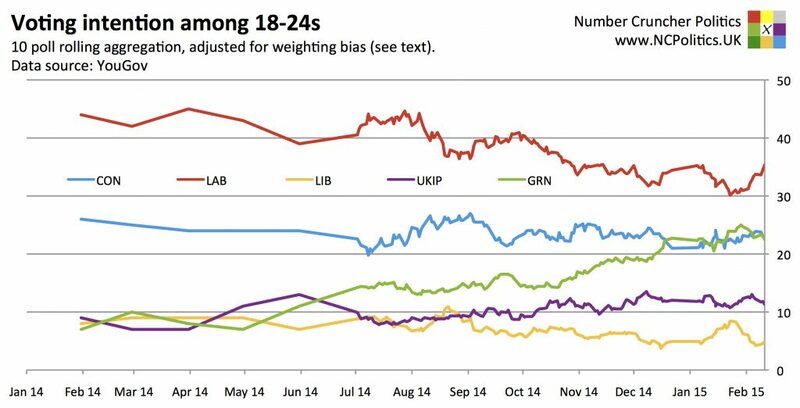 Elsewhere, among under-25s generally, my weighting bias-adjusted YouGov aggregation found toplines of CON 23 (=) LAB 35 (+5) LIB 5 (-3) UKIP 11 (=) GRN 23 (-1). This might suggest that last time’s moves (mainly Lib-Lab switching) were just a blip – remember that in addition to the normal margin of error, the weighting bias is only an estimate. But in any case, Labour continue to lead, with the Greens and Conservatives close for 2nd. The big unknown for the election will likely be the Greens – these numbers suggest that their legwork on campus is paying off, but their organisation has yet to be tested in the way it will in May. I can’t think of any time when a UK party been so heavily reliant on student votes – we’ll see if they’ve done their homework.